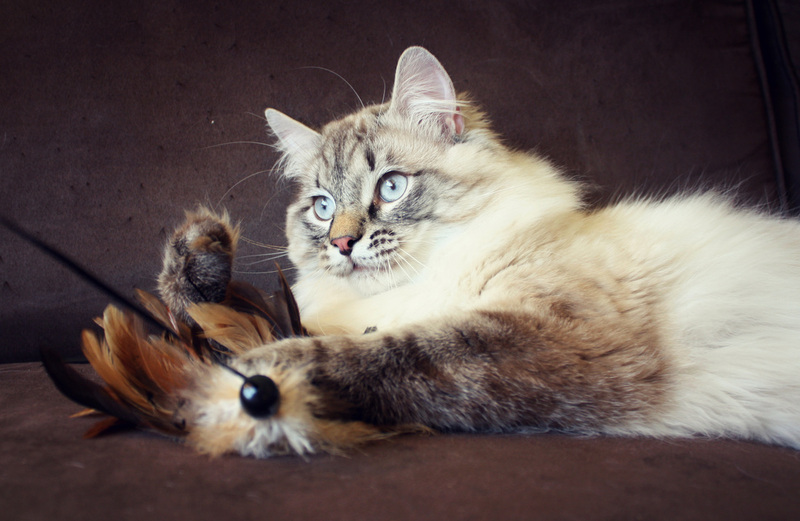 Ballana's kittens Mar '15 - Daisley Siberians Welcome to the kitten site! NEWS ALEXZANDER SOLD. Congratulations Nick and JoAnne! Ballana's kittens are gaining weight.. although weight gain has never been a challenge.. they have been 'fat' since they were born. Thor, the lynxpoint male continues to be super silly.. and the three brown tabbies are all competing for the cutest moves. Xena likes jumping straight into the air onto the curtains and then falls back down behind the couch. Alex has discovered birds. Although he has a very short attention span, normal to his age, he quivers with excitement while watching the Red-wing blackbirds on our bird feeder. Comma has taken to napping on top of freshly folded laundry. I will be taking notes on their personalities over the next 10 days and matching them with buyers waiting patiently on the waiting list. Big vet visit today. 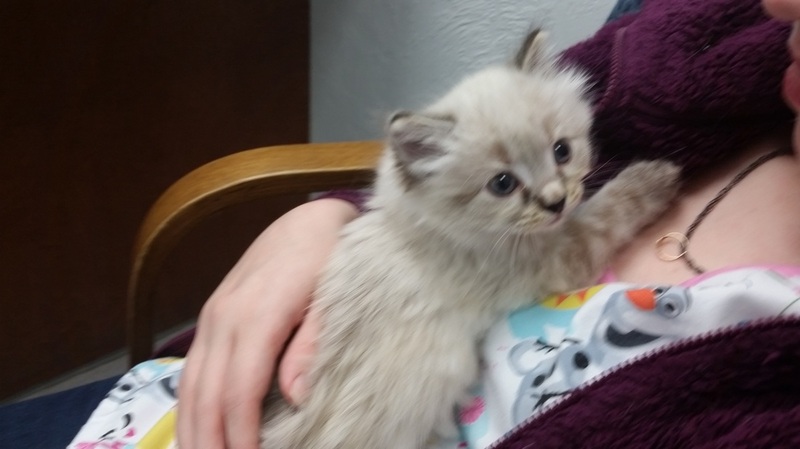 "Thor", the lynxpoint male below enjoyed cuddling with the vet tech Kaitlyn. 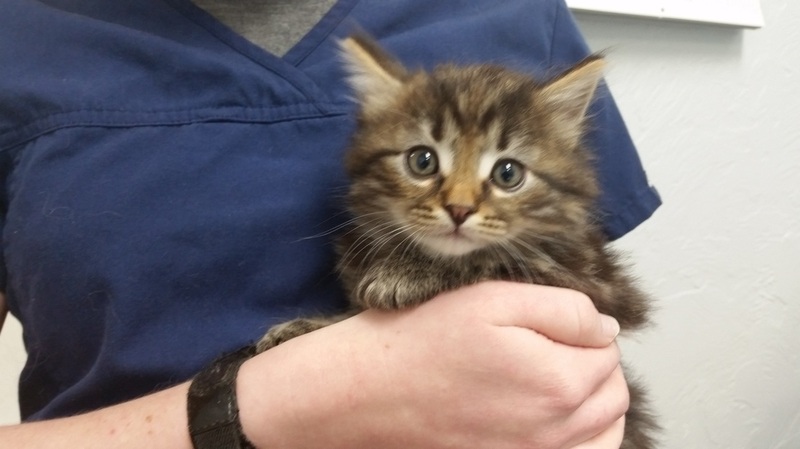 He is a big, bright eyed, healthy confident little guy. The name Thor suits him as he is bold and warrior-like. He, like the other in this litter are as tall as they are long.. very blocky and solid like their mother, Ballana. Thor is the big lynx male. Xena is the larger black/brown female tabby. Alexander is the large black tabby male. Commadora is the smaller brown/black tabby female. Commadora is on breeder reserve to stay in the cattery. Thor enjoying his exam i.e. cuddle at the vet today. One of the two black/brown tabby females. Her name is Xena, warrior princess. She is large and likes to tackle her brothers. 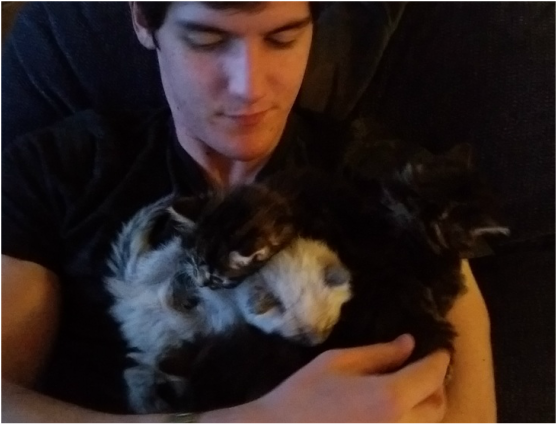 My son, John, started with all four kittens in his lap and an hour later they were all asleep. Four gorgeous chunky monkeys. Ready for new homes on the weekend of June 12th. Here they are taking their first steps and "wobbling" around in the kitten room. As they learn the meaning of the potty box I will add new toys and climbing structures and scratching posts. At this time it looks like there are two males and two females. There is one very large fat, lazy and vocal black tabby "mama's boy".. and one active lynxpoint who is very quick to use eye contact with me when I enter the room. The kittens are still napping most of the day and sleep in a 'puppy pile'. Babies venture outside the nest box. The little wobbly sweeties have moved out of my bedroom and into the 'kitten room'. They had their first vet exam on Thursday. It looks like we have two twin brown/black tabby females, one large black tabby male and one lynxpoint male. Names and individual photos coming soon. The kittens are exploring outside of the nest box. Their little legs are building muscle tone and coordination skills.